Seaglass turtle art, handmade original framed and matted artwork made from 100% beach found treasures. 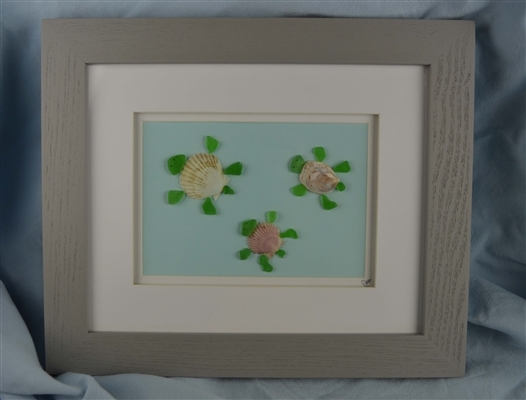 Turtle family scene made from seaglass and natural beach treasures in a grey frame. Overall frame dimensions approximately: 10 inches x 12.0 inches. Inside matted scene measures approximately: 5 inches x 7 inches. Please see photo for exact piece of art. Can be switched into a white frame as well. Can free stand on shelf or be hung by hanger on back.